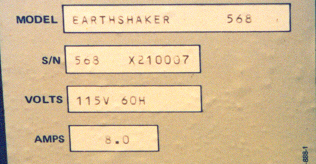 This page is here to share what I've found out about the prototype run of the "Earthshaker!" pinball machine. It has been a number of years since I inquired about this information, the following is what I recall being told by the design team members. If you believe there is incorrect information or if you have factual information to include with this page please let me know. I'll do my best to make this page readable, but I am not an English major, teacher, professor, or even one who should claim he can use the language correctly. This is also my first attempt at a web page so there are problems, pictures, and text. I thought about using thumbnails so the page would load faster, but seeing as how you're probably here specifically for these pictures why be redundant and make you load each one separately. Also I'm sure all my faults, mistakes, and whatever else will be posted and shredded somewhere, but thanks for stopping by. 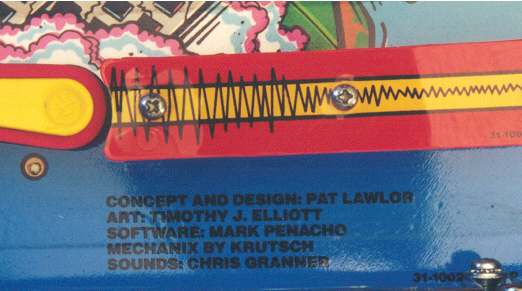 I would like to take a paragraph to thank EVERYONE that has had anything to do with designing and producing pinball, especially those who have taken time out to visit the various expos/show over the years. Also for speaking with the collectors and sharing their wealth of information and interest in our hobby, that is their job. Most of us could only hope to have such a fun job. As with others before them, I'm saddened at the passing of Williams. That all being said, hopefully the page has loaded and now you may continue on. From what I remember being told by Larry DeMar a number of years ago the run started at 210000, the X in font of the number was used on the first twelve to denote them as the original prototypes. 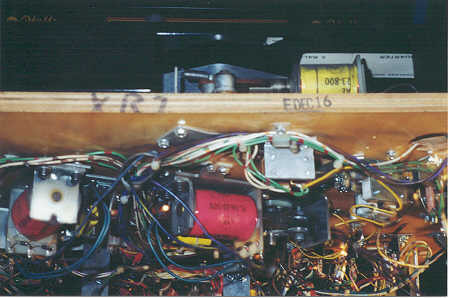 This is the bottom edge of the playfield, the XR7 is there to denote that it is a diamond coat playfield. I seem to remember being told that at the time they had made twelve initial prototypes. I believe that all twelve went out with the diamond coat playfields. On the diamond coat playfield Mr. Elliott and Mr. Penacho's names are reversed. 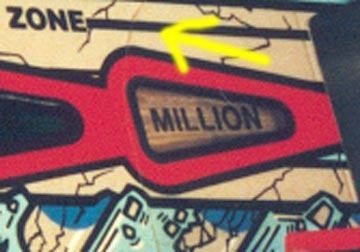 The 6X multipliers are far smaller than the normal playfield. It's a little hard to tell from the picture, but 3 miles was originally in place of million. They had evidently scraped off 3 miles and made a clear little tab labeled million and than placed mylar over it.